After a longer sleep than the night before I woke up to find that the showers in the Hostel in which I'm staying are communal, like the old footy club showers. So be it I thought and turned the shower on which nearly knocked me off my feet and washed me down the drain. The power out of the shower was immense, couldn't believe it. If anyone has seen the Seinfeld episode where Kramer gets a new showerhead, well, that was me today. Caught the train into Brussels Central Station that took approx. 15 minutes and cost 1.80 euro. The weather today was really nice and so started my walking adventure through Brussels starting with a look at Galleries Royal St Hubert, a shopping mall in an exquisite French building housing some very expensive shops, most of which were just ever so slightly outside my price range. 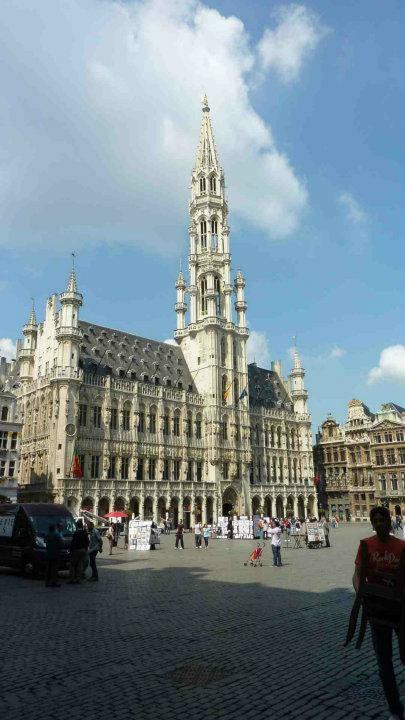 I then continued down to Grand Place, Brussels market square so the speak. The buildings here were amazing and I took a small video to show everyone when I get back home. After hearing so much about these Frities (Belgium fries) I had to go and taste some of the local cuisine. I asked for mayonnaise topping and whilst eating the snack I could almost feel my heart failing with the amount of fat and calories I was consuming, but it was all for a good cause. After refueling myself I spent the next 4-5 hours just wondering the streets taking in some basic tourist sightseeing including the stock exchange building, Parc de Brussels which is the city park. It was here that i had to pay 50 cents to use a toilet.....what the? Also looked at the Mannekkin Pis, which is a statue of a young boy holding his wizza and peeing dressed in a weird costume. People where everywhere around that thing but I just didn't get the attraction to be honest. Looked at the Royal Palace that is just opposite the Park, like the Brits, they have traditional armed soldiers patrolling the grounds; kind of cool to watch them do their marching and turns etc. Up the road from that was the Palais de Justice or courthouse. This was easily the largest building I saw in Brussels. Very impressive to look at although there was a lot of scaffolding around with people doing repairs when I was there. It was at this spot which is in an elevated position that I was able to take some night skyline shots of Brussels and surrounding areas. From here I made my way back down the Grand Place where I stopped off via the Mannekkin Pis to grab a waffle with banana and chocolate for an afternoon snake. It was now that the heavens opened up fairly hard so I decided to call it a day. Tomorrow I check out of my Hostel and will spend the morning in Brussels again as there is a Auto Museum I wanted to see. Then I make my way up to Amsterdam for a few days........wish me luck !